An Egyptian family recently found the remains of a 3,400 year-old temple underneath their home. So they did what any would-be archaeologists would do: They started digging. They've now been arrested by the police for illegal excavation. As Egyptian newspaper Al Ahram reports, the find was made two weeks ago. But instead of reporting it to the proper authorities, the seven residents of the Giza district started to conduct their own excavation. The temple dates back to the time of New Kingdom King Tuthmose III, who ruled from 1479 to 1425 BC. He expanded the Egyptian Empire to its largest extent, from northern Syria to the Nile's fourth cataract in present day Sudan. The diggers found huge limestock blocks engraved with hieroglyphs. They also discovered seven reliefs, two marble columns, and a huge red-granite statue of an armless seated person. In addition, the police found diving costumes, oxygen cylinders, and diving masks with the detainees. 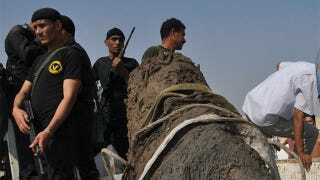 Egypt's tourism and antiquities police heard of the illegal dig, who dispatched a police unit to arrest the seven men, two of whom are Palestinian. The items have been brought to the Saqqara site for restoration and further study. The Hod Zeleikha area has now been declared an archaeological site and is now under the control of the interior ministry. King Tuthmose's mummy was discovered in 1881 in the Valley of the Kings.